Impressively directed and brilliantly acted, this is a hugely enjoyable, superbly written coming-of-age comedy-drama that plays like a British version of Rushmore. 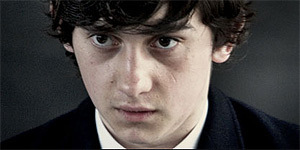 Written and directed by Richard Ayoade (making his feature debut), Submarine is based on the novel by Joe Dunthorne and stars Craig Roberts as Oliver Tate, a nerdy, articulate, duffel-coat-clad 15-year-old who falls for supercool outcast-slash-arsonist Jordana (Yasmin Paige) and is dumbstruck when she agrees to go out with him. At the same time, Oliver realises that his parents (Sally Hawkins as Jill and Noah Taylor as Lloyd) are on the verge of splitting up so he schemes to keep them together, but things are complicated by the fact that Jill's ex-boyfriend, New Age ninja-hippie Graham (Paddy Considine) has just moved in next door. Roberts is superb as Oliver, displaying a neat line in blank-faced deadpan delivery that's all the more effective for the fleeting moments where his emotions shine through, such as his expression after his first kiss with Jordana. Similarly, Paige is terrific as the painfully cool object of his affections (expect red duffel coat sales to go through the roof) and there's strong, likeable chemistry between the two. In addition, Sally Hawkins is wonderful as Jill, while Paddy Considine is clearly enjoying himself as the posturing Graham, but it's actually Noah Taylor who gets the film's biggest laughs – his conversations with Oliver about women are one of several comic highlights. The script is frequently hilarious, especially in the first half, where Ayoade has a lot of fun with the novel's first person narration, illustrating Oliver's voiceover with a series of impeccably edited comic vignettes. Ayoade's influences as a filmmaker are very much to the fore (from the superb use of a specially written soundtrack by Arctic Monkeys' Alex Turner to the Ma Nuit Chez Maud poster on Oliver's wall) but the various techniques never seem forced and are often dizzyingly brilliant, particularly during the first kiss scenes, where freeze-frames, sudden close-ups and 360 degree pans all combine to winning effect. That said, the enjoyably inventive spark from the first half of the film is largely absent in the second half as the plot begins to take over and although the second half is still good, it's not as catch-your-breath impressive or as laugh-out-loud funny as the first. Submarine is a hugely enjoyable, frequently funny and superbly acted comedy-drama that marks writer-director Ayoade out as a talent to watch. Highly recommended.